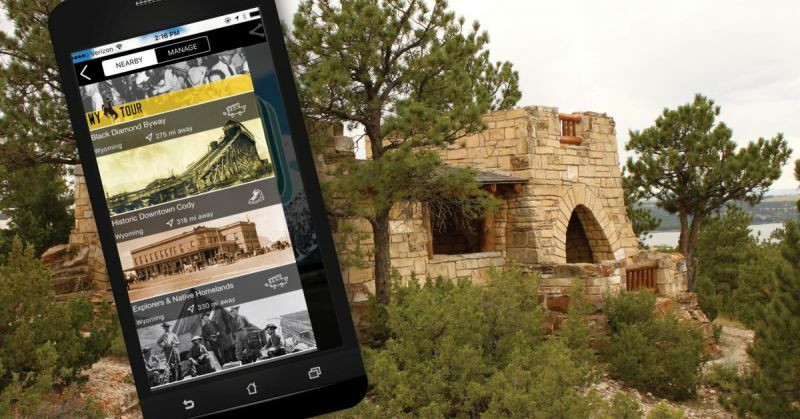 Guernsey State Park was recently added to the TravelStorys App, a multimedia tour guide that can be downloaded on iphone or Android automatically triggering stories, based on the users location to Wyoming’s rich culture and history. The Guernsey State Park tour explores the finest examples of Civilian Conservation Corps (CCC) work in the Rocky Mountain area. The planning and construction of Guernsey State Park was a first-of-its-kind cooperative venture between the Bureau of Reclamation, the National Park Service, and the Civilian Conservation Corps. This audio tour tells the story behind the creation one of the most significant Depression era parks in the nation. In addition to a museum, the castle picnic shelter, and more, an extensive network of trails was originally planned and partially built during the operation of the CCC camps. Ever since that time hiking and trail use has been a major feature at Guernsey State Park. Approximately ten miles of CCC trails have been restored on the park. The starting point for the trail system is at the Brimmer Point turnoff. The trail system consists of several loops which provide a variety of scenic views of the park, reservoir and the dam. Most of the trails are moderately physically demanding. Trona Trail -Wyoming’s top overseas export, trona is processed into soda ash and is used in nearly every commercial product today. Learn about the origin of trona dating back to 45-55 million years ago and how the discovery of trona in Sweetwater County occurred in a surprising way. Sponsored by Wyoming State Historic Preservation Office and WyoHistory.org. Guernsey State Park: The successful efforts of a joint venture between the Bureau of Reclamation, the National Park Service and the Civilian Conservation Corps made Guernsey State Park the model for how to develop recreation areas at sites throughout the West – including well-known sites as Lake Powell and Lake Mead. Sponsored by Wyoming State Parks, Historic Sites and Trails with special consideration given to Click Point Ranch who produced the original tour CCC tour. The public can download the FREE App at www.travelstorys.com The Guernsey State Park Reservoir silt run is currently taking place, reducing water levels. Normal conditions and water recreation will be available after July 30. Until then visitors are encouraged to camp, hike, bike, visit the museum and tour the park. For more information about Guernsey State Park call 307-836-2334.